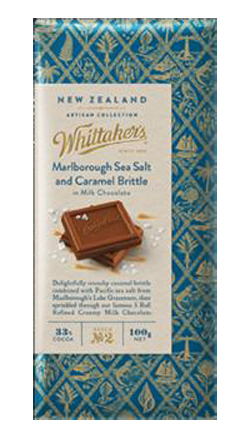 Delightfully crunchy caramel brittle combined with Pacific sea salt from Marlborough's Lake Grassmere, then sprinkled through our famous 5 Roll Refined Creamy Milk chocolate. Milk Chocolate (Sugar, Cocoa Solids (Cocoa Butter, Cocoa Mass), Milk Powder, Emulsifier (Soy Lecithin), Vanilla Flavour), Salted Caramel Pieces (10%) (Sugar, Glucose, Salt, Clarified Butter (Milk), Water, Emulsifier (Soy Lecithin), Natural Flavour, Natural Colour (E150a)). This chocolate has to be one of the best I have tasted, it’s so creamy then you have the crunch of the caramel and the slight saltiness, combined it gives you a party in your mouth.